Doha, Qatar – April 8, 2019 – At an annual ceremony to recognize the academic work of NU-Q students, documentaries about the worth of the Lebanese Lira, fiction films on the internal struggles of women with Afro hair, investigative articles on the segregation of migrant workers, and an interview with Northwestern alumnus and producer of the Hollywood musical La La Land Jordan Horowitz, took center stage. The Media and Research Showcase and Awards recognize student work across a variety of disciplines in journalism, communication, and research. The nominees are determined by NU-Q faculty and then judged by a panel of judges from the local community. 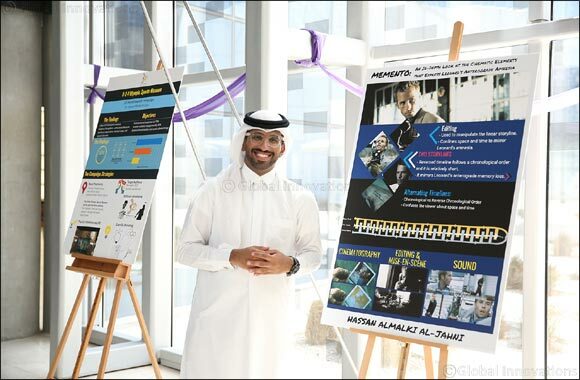 The nominated works are showcased during a poster session and media showcase, then awarded later that same day at a gala dinner and ceremony. “Every year, the Media and Research Showcase turns our building into a creative enterprise showcasing the work done by our students that illustrates in the best possible way their achievements in research, journalism, strategic communication, and filmmaking,” said Everette E. Dennis, dean and CEO. This year, 14 students were awarded for media and research projects they produced that tackled a number of important social, cultural, and political issues. The judges this year were invited from leading media organizations that include Al Jazeera, Doha Film Institute, Ginger Camel, Film House, I Love Qatar, Gulf Times, Memac Ogilvy, Al Kass TV, NU-Q, and other institutions around Education City. Previous student winners have also received regional and international recognition for their work, including being selected as a judges’ favorite at the Cannes Film Festival’s short film corner; having a documentary broadcast by the Al Jazeera network, and being published in Northwestern University’s Research Journal. Students submit their work in ten categories, with judges selected for each category to make the final selection of the winning project in each.